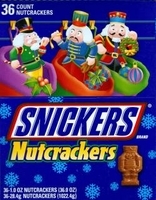 Snickers Nutcrackers are the perfect Christmas candy and stocking stuffer. The same great tasting snickers bars just shaped like a nutcracker. These little guys are crammed full of peanuts,caramel and nougat all coated with a creamy milk chocolate. If you know someone who loves snickers candy bars then this is the perfect treat. Snickers have been around since 1930's and still after more then 75 years they are still one of the top selling bars. Each box of snickers nutcrackers has 24 individually wrapped treats.